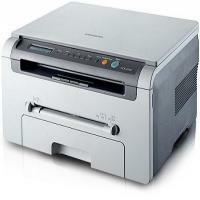 The Samsung SCX4200 is a monochrome multifunction laser printer that provides scan, copy and print features. Due to its high print speed and great print quality, it would fit right into any home or small office with low-volume needs. The printer comes with a ‘starter’ Samsung SCX4200 toner cartridge which yields up to 1,000 pages. The device weighs 9.29 kg measuring 40.8 x 36.3 x 23.1 cm respectively. It is conventionally laid out with with a 250-sheet paper tray at the bottom, a manual document feeder for special media above the input tray, and then a 50 sheet output tray for storing printed pages and above that the control panel and the cover for the flatbed scanner. It has a well designed control panel with two line LCD display followed by a row of eight buttons. Five buttons constitute to the simple menu system, while the remaining three buttons is for copy, scanned jobs and to select number of copies. The printing speed of this printer is 19 ppm having a resolution up to 600 x 600 dpi and the scanning resolution of this printer is up to 4,800 x 4,800 dpi. It supports various print media such as cards, labels, envelopes, and plain paper. It also supports USB connectivity option. It supports toner save mode by scanning both side of the documents and printing onto a single page. The power consumption of this device is 350 watts of energy. The consumption is reduced to 70 W during standby mode and 10 W during sleep mode. Scx4200 multifunction laser printer has the ability to print, scan and copy. It makes a good choice for home user or small office due to its high printing speed and quality printouts. However, it may not meet the demands of a larger business as it lacks faxing function and does not support larger forms of print media. Also there is no Wi-Fi connectivity option in this printer which might be the major drawback of this device as compared to other competitors lying in the same class, offering Wi-Fi connectivity feature. After the replacement of Samsung SCX4200 toner cartridge, the device can print an estimated 4,000 pages at a time. What to do when your Samsung SCX4200 prints light or faded printouts? Using media that do not meet Samsung’s specifications might result into faded printouts. Always use print materials that meet the guidelines for use with your printer. If the entire page is light, it might be possible that the print resolution setting is too low or the toner save mode is on. Adjust the print resolution and turn the toner save mode off. Once the process is completed, make a test print on the paper you inserted earlier. If still the printouts are not satisfactory, then we would recommend you to contact the Samsung support. Q. What is the page yield I can expect from Samsung SCX4200 toner cartridges? A. Up to 3,500 pages. Q. Are Samsung SCX4200 toner cartridges compatible with more than one printer or do they work only with Samsung SCX4200 printer? A. These toner cartridges work with other Samsung SCX-4200 printers besides Samsung SCX4200. Q. How do I know that non-genuine Samsung SCX4200 toner cartridges print as well as genuine toner cartridges do? A. Non-genuine Samsung toner cartridges are put through strictest quality tests and only then given approval for use so you can be sure that their quality is maintained. Q. I’ve been noticing some white streaks in my printouts lately. Is there anything wrong with the printer or are the Samsung SCX4200 toner cartridges that I’m using of inferior quality? A. No, your cartridges aren’t of poor quality and your printer may also not have any problem. You need to redistribute toner in the toner cartridge. Take your toner cartridge out, shake it to and fro gently and install it again..
Q. Some toner fell on my clothes while replacing Samsung SCX4200 toner cartridges. How do I remove it? A. Take a dry cloth and wipe toner off with it. Wash the affected area in cold water carefully. Q. How is contact with the green are of Samsung SCX4200 toner cartridges best avoided? Does it damage the toner cartridge severely if touched? A. You’ll see a handle on the cartridge. You need to hold the toner by the handle and then install it into the printer. Yes, touching the green area of the cartridge can harm it and cause it to stop functioning. Q. I noticed some loose toner that has spilled on the printer and on parts nearby. How do I go about cleaning it? Please advise. Thanks. A. Take a slightly wet soft cloth or tissue and wipe the affected areas gently with it. make sure that the cloth or tissue you use is dampened very slightly and not dripping with water.